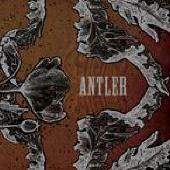 Antler's self-titled debut is a slow, deliberately darkened style of Southern rock that strolls along at a leisurely pace, never really getting your heart pumping but never boring you either. The dusky mood of songs like "Tombstones and Cigarettes" and "My Life" and the occasional burst of energy - such as the sudden, frenzied guitar solo in "Dead By Valentines" - are the stuff you might expect from a band in a David Lynch film. There's a weird, eerie feel to every track that gives it a strangely supernatural feel. Antler's not for everybody. The first track on the CD, "Tombstones and Cigarettes," could have been a song by the Doors, another band that's not for everyone. This CD has that same, indescribable aura that the Doors are legendary for. It's music that's just slightly off-kilter and darker in attitude and tone. Worth seeking out if you're looking for something just a little different. For more information, check out http://www.antlerband.com.